Receive up to 20% off your stay of 3 nights or more this fall when you stay with Cottage Rental Agency. 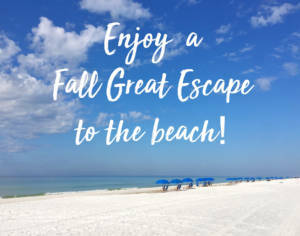 The fall events in Seaside and along 30A will be in full swing and there’s no better time to visit. Wait, what could make it better? 20% off your stay. Call us to receive this offer and get your Fall Great Escape – 866-976-4941. Cottage Rental Agency’s Fall Great Escape offer is available for stays of 3 or more nights, 8/12/18 -11/12/18 for participating cottages. Blackout dates apply and are 10/4-10/15/18; not applicable for existing reservations or groups; additional restrictions may apply. Call and book your vacation today: 1-866-976-4941. CRA Reservations Office is open 8am – 7pm, seven days a week.